I feel humbled. Since publishing my latest personal essay last week, I’ve received dozens of emails, Facebook messages and comments about it. I’ve heard from people who have had their own struggles with eating, people who have had issues with depression and anxiety, and people who have friends or loved with eating disorders. I’ve also heard from friends who wanted to offer support. I’ve been surprised by how many readers said they cried when they read my dad’s letter, which I highlighted in the essay. Perhaps this is because people who may not have been able to relate to the eating issues I described could at least relate to knowing what it’s like to have (or, depending on their situation, long for) a good father. The responses have reminded me that we all struggle — often behind closed doors. And they’ve made me feel more motivated than ever to write a memoir. I’ve been continuously confused about where to start my memoir. I’ve always disliked writing leads; it’s the toughest part of the writing process for me. I want my lead to be perfect before I move on. And if it’s not, I feel stuck. One of my mentors recently reminded me, though, that you don’t always need to know where your story begins. Sometimes you just need to start writing. My goal for this month is to write three key scenes and then decide which one I might want to start my memoir with. If I can write a series of scenes, rather than continuing to write a series of personal essays, I think I’ll be off to a good start. It could be a scene from when I was hospitalized, from a mother-daughter moment, or from the present day. Or maybe it’s a scene illustrating a part of my life that I have yet to write publicly about — how I reacted when my dad first started dating after my mom died, for instance, and what it’s like to now have a step-mom. 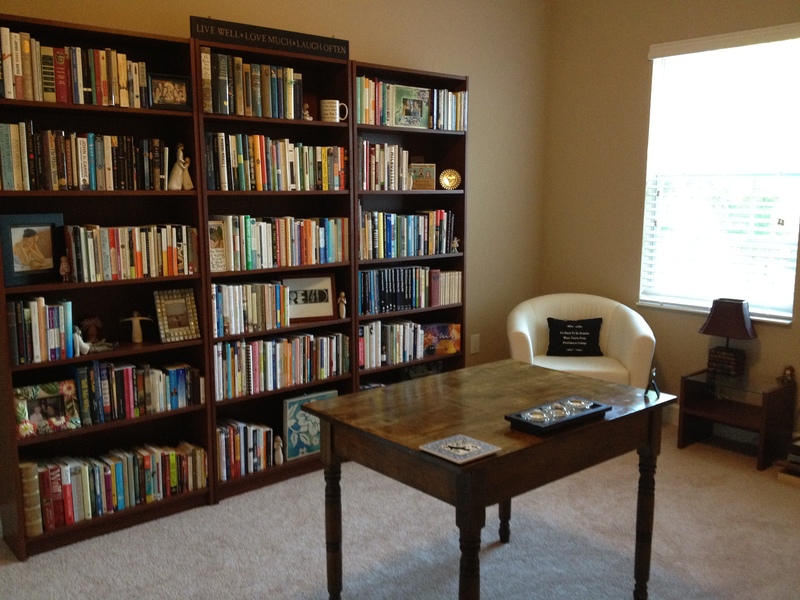 My office, complete with bookcases and a little desk. Now I just need to find a chair for it! As I delve deeper into my memoir project, I want to challenge myself to explore areas of my life that I haven’t written about, and also do a little reporting. My plan is to do more research on eating disorders and grief, and also interview loved ones to see if their memories match mine. As part of my research, I recently requested a copy of my medical records from Children’s Hospital in Boston to old get more specifics about my medical history and make sure my memories of it are accurate. I now have a desk (an 1850’s farm table that I just bought at a local antique store) in my office at home. I think having my own little writing corner will help me focus, and remind me to take the time to write. I’ll keep you posted on my progress. Can’t wait to read the memoir, Mal. Beautiful office! Love those bookshelves. Do you know http://bookshelfporn.com/? I’d love to subscribe to your blog by email. Have you thought about putting a subscription box on your blog? I do know of that site and like some of the bookshelves it features. … There’s a “follow” option on my blog (see the top nav bar), but I should look into adding a more prominent subscription box.